Background: Frequently autologous fat graft is applied in breast reconstruction for the treatment and the correction of local deformities and pain syndromes. This could be useful also in patients that underwent reconstruction after surgery following breast cancer. However, these patients frequently are treated with tamoxifen (TAM). It is reported in literature that tamoxifen reduced cellular function and the ability to differentiate of adipose derive stem cell (ASC) in vitro. The authors decided to evaluate the ex-vivo effect of tamoxifen on ASC from patients treated with mastectomy or quadrantectomy plus tamoxifen to understand if the cellular function od ASC are affected by TAM treatment or not. Methods: We selected 15 female patient patients treated with mastectomy or quadrantectomy plus tamoxifen and pain syndrome correction with autologous fat graft and as control 15 female normo-mestruating patients treated for scar tissue with autologous fat graft. Fat tissue was drawn bilaterally from the flanks then adipose tissues were digested with collagenase I for 1h at 37°. After 10 min at 1200 g centrifuged, ASC were cultured at 37° in low glucose DMEM medium without phenol red, supplemented with 10% FBS, 1% P/S, 1% ultra-glutamine. Between passages 1-2 cells were controlled at FACS for expression marker (CD105, CD73, CD44, CD90) of ASC and submitted for experiments at passages 2-6. The effect of TAM on cellular functions was evaluated by cell proliferation (CyQuant cell proliferation Kit - Thermo Fisher), apoptosis (Annexin V – 7AAD - Biolegend), osteoblast or adipocytes differentiation and VEGF secretion (R&D duo set VEGF ELISA). Results: We found that TAM as not effect on ex-vivo ASC obtained from patients treated with TAM or normo-mestruating patients. Tamoxifen didn't inhibit cellular proliferation at 4 and 8 days of culture (p>0,9). 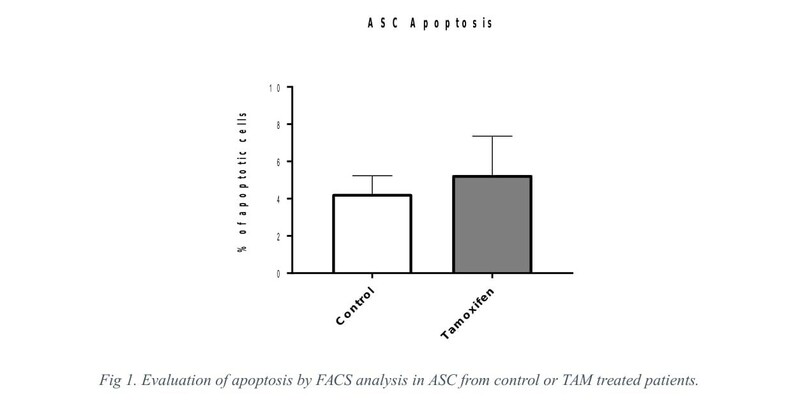 Moreover, we observed that TAM had no effect also on apoptosis, measured by FACS analysis, after 48h of culture (p>0,28). Preliminary results shown also no differences in VEGF secretion (assessed by ELISA) and in adipocytes differentiation after 3 weeks of culture with the induction medium. Interestingly, our preliminary results shown less osteoblastic differentiation capability of ASC from patients treated with TAM. Conclusion: With this study we assessed the effect of tamoxifen on ex-vivo ASC from control or TAM treated patients. Our results shown, for the first time in an ex-vivo single centre study, that tamoxifen as no effect on cellular functions of adipose derive stem cells. We hypothesized that this could be explained by the fact that Tamoxifen, which requires conversion into active metabolites (Z)-4-hydroxytamoxifen and (Z)-endoxifen that have up to 100-fold higher ER affinity than the parent drug, it accumulates in the adipose tissues predominantly as TAM. In conclusion, this study demonstrated that the autologous fat graft can be equally efficient even in patients treated with tamoxifen.